Hydra Shield Launches Fyrelane USA Brand 2018 Catalog. Fyrelane USA releases its 2018 catalog early. Fyrelane continues to grow it’s brand in a competitive market and brings innovative products to its product line. Stay tuned and check back on www.FyrelaneUSA.com or www.HydraShieldinc.com for updates and new product developments. Effective the week of December 18th thru Jan 2nd We will not ship or receive any product due to our plant closures. Our warehouse and manufacturing operations will resume normal business operations on January 2nd 2018. Hydra Shield’s corporate office will be closed on December 25th and December 26th. 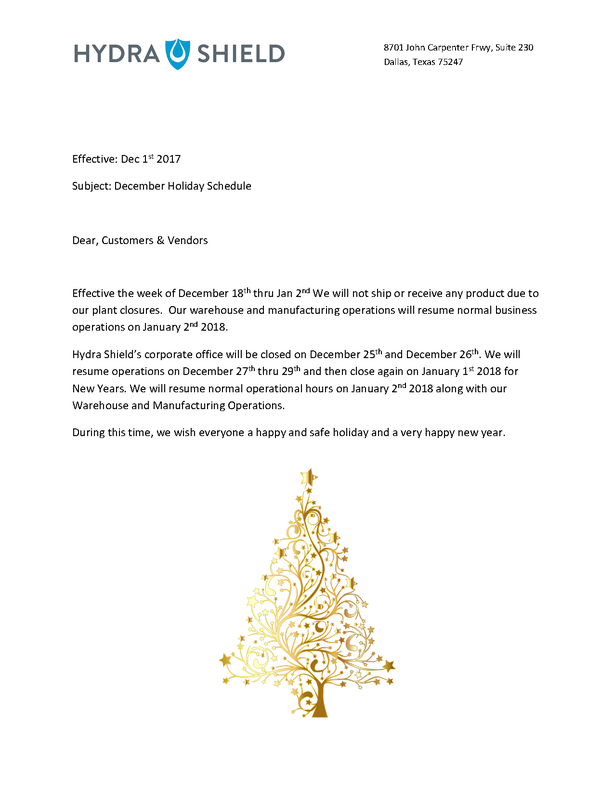 We will resume operations on December 27th thru 29th and then close again on January 1st 2018 for New Years. We will resume normal operational hours on January 2nd 2018 along with our Warehouse and Manufacturing Operations. During this time, we wish everyone a happy and safe holiday and a very happy new year.